Habit: Annual, tufted, soft-hairy. Stem: ascending to erect, generally 10--50 cm, hairy. Leaf: basal and cauline; sheath inflated, loosely surrounding stem; ligule membranous, truncate, densely hairy; blade 2--10 cm, 3--10 mm wide, flat. Inflorescence: terminal, 1.5--3 cm, ovoid to +- cylindric, dense, hairy; spikelets generally subsessile. 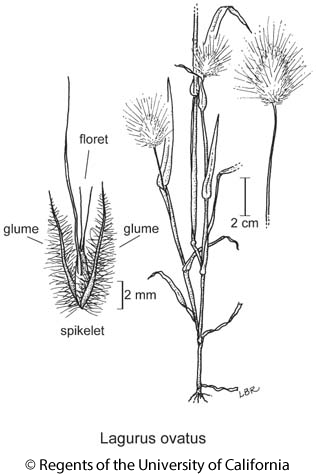 Spikelet: 7--10 mm (except awns), laterally compressed; glumes equal, > floret, narrowly lanceolate, soft-hairy to plumose, long-tapered; axis breaking apart above glumes, prolonged beyond floret; floret 1; lemma 3.5--4.5 mm, back glabrous, base puberulent, faintly 5-veined, awns 3, 2 from tip 1--2(6) mm, slender, 1 from lemma back generally 8--22 mm, +- stiff, bent; palea +- = lemma. Chromosomes: 2n=14. Ecology: Disturbed places; Elevation: generally < 200 m. Bioregional Distribution: NCo (Humboldt Co.), ScV, CCo, SnFrB; Distribution Outside California: Oregon, Canada, eastern United States, New Mexico; native to Mediterranean. Flowering Time: May--Jul Note: Cult for ornamental, dried arrangements. Citation for this treatment: James P. Smith, Jr. 2012, Lagurus ovatus, in Jepson Flora Project (eds.) Jepson eFlora, http://ucjeps.berkeley.edu/eflora/eflora_display.php?tid=30144, accessed on April 26, 2019. NCo (Humboldt Co.), ScV, CCo, SnFrB; Markers link to CCH specimen records. Yellow markers indicate records that may provide evidence for eFlora range revision or may have georeferencing or identification issues. Purple markers indicate specimens collected from a garden, greenhouse, or other non-wild location.